Help keep your home in tip-top shape. From stain and odor removers to pet hair cleanup and keeping the litter box neat and tidy, we have all you need to help out around the house. Pet supplies to help you live with your pets - get rid of pet stains, cat pee smell, cat litter smell, and pet hair. Household Helpers There is 1 product. Remove pet stains and odors, clean cat messes like urine, vomit, pee, poop, hairballs, and all sorts of pet stains and smells. Remove cat urine smell, cat pee smell, dog urine stains and pet stains with these specially formulated products. Keep your litter box area in tip top shape with litter box cleaning wipes and sprays, litter trapping mats to prevent litter being tracked all over your house, litter box liners and more. Did you know your cat litter box could smell good? Supplies for cat cat litter cleaning and cat litter smells. Pet hair brushes, sticky rollers for cat and dog hair, and furniture protectors. Clean pet hair from fabrics and furniture with pet hair tape rollers and special brushes. Chewing deterrents and items to train your pet to behave. Train pets not to chew cords and furniture with bitter sprays and chew toys for cats and puppies. 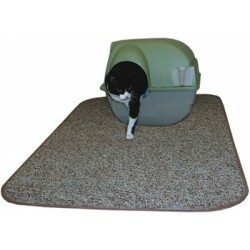 The Heavy Duty Litter Mat features a grassy surface that is gentle on cats' paws and tough on litter tracking.